The Advanced Engineering Centre (AEC) is an internationally-recognised centre of research excellence with an established track record of pioneering research in applied thermofluids, including automotive engineering, heat transfer, sprays and two phase flows. Led by Professor Morgan Heikal, the centre has an international reputation for producing innovative, future-facing research. 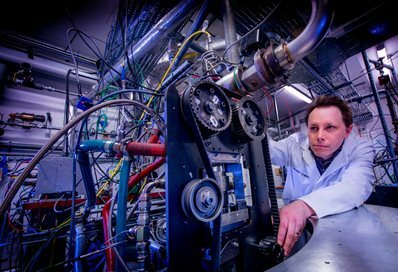 We investigate and optimise complex engine combustion processes and develop laser-based measurement techniques, fundamental modelling and computational simulation. We work alongside global academics, industry leaders and policymakers to significantly impact the transportation, aerospace and medical sectors. Our focus is on applied research and development for the solution of industrial and commercial problems. Our research centre has built a 20-year partnership with Ricardo plc, culminating in the establishment of the world-leading Sir Harry Ricardo Laboratories (SHRL) and a rich, ongoing collaboration. We conduct pioneering work on novel low carbon internal combustion systems and have a direct environmental impact through creating greater fuel efficiency and developing ways in which to reduce CO2 and other harmful emissions. Our research team collaborates on a national and international scale, with more than 40 academic institutions and 30 commercial companies and receives a balance of funding from government, Research Councils and industry. Taamallah, S., Dagan, Y., Chakroun, N., Shanbhogue, S., Vogiatzaki, K. & Ghoniem, A. F., 5 Feb 2019, 31, 2, 025108.